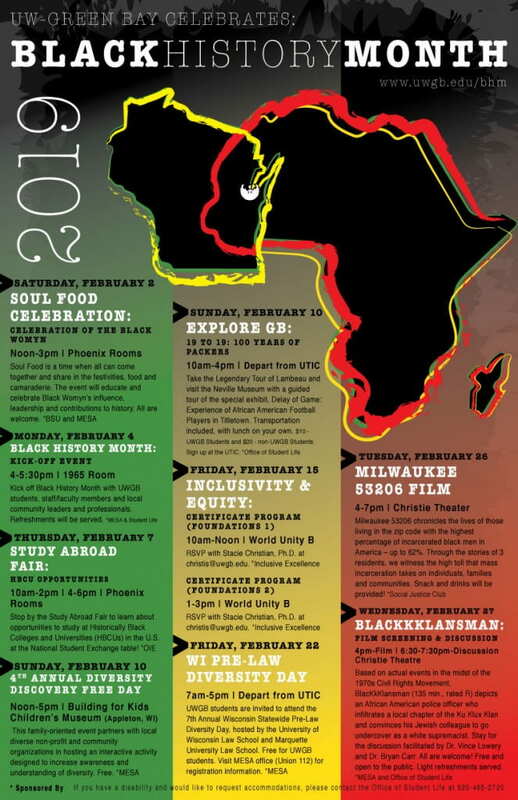 UW-Green Bay will launch Black History Month with a Celebration Kick-off Event, Monday, Feb. 4 from 4 to 5:30 p.m. Expect an interactive performance by nationally known spoken word artist, writer, educator, organizer and motivational speaker Kwabena Antoine Nixon. $10 – UWGB Students and $20 – non-UWGB Students. Sign up at the UTIC. RSVP with Stacie Christian, Ph.D. at christis@uwgb.edu. This entry was posted in News and tagged Black History Month, MESA on January 24, 2019 by Kimberly Vlies.